This is one of my favorite light summer lunches. It’s really easy – particularly if you have leftover cooked chicken around (or if you are lazy like yours truly and buy the big bag of rotisserie chicken meat from Costco…). It’s also a fantastic way to introduce toddlers to complex flavors, if you’re doing baby led weaning or just want to try some new things. The original recipe comes from the domestic goddess herself, Nigella Lawson. I’ve adapted it to make it a little simpler, so I don’t have to shop for anything I wouldn’t normally be buying anyway. I’m also not too strict about the amounts I put in, as usual, so feel free to improvise. 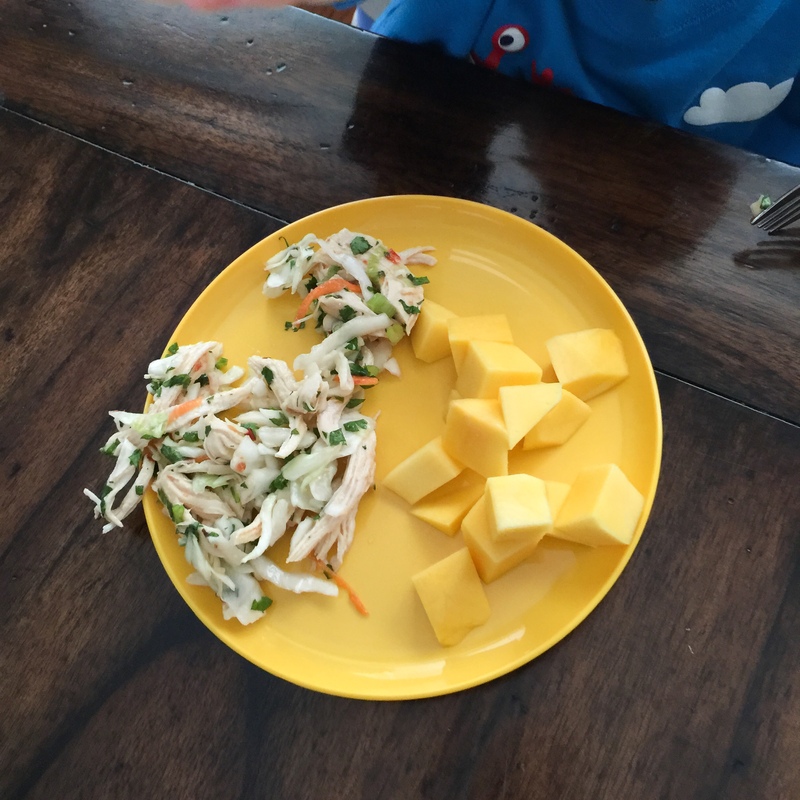 This is amazing served as I did here, just with some cut up mango (my kids love mango!). If you’re feeling even more inspired, you can make up a cold glass of fancy limeade or cucumber water and pretend you’re in a spa. At least until you have to help your toddler with his fork again. Oh, hi, blog. It’s been a while. I owe you some recipes and a day in the life post that’s a month overdue. Sorry about that. In the meantime, let’s talk about writing! I went to a blurb/back cover copy workshop with the Maryland Romance Writers last week, and it was fabulous. I struggled mightily with a blurb for the book I’m actually working on – the historical fantasy I submitted to a contest a few months ago. It needs to get done! With help, I managed to finally come up with something decent (more on that another time) – but then I was inevitably distracted. On the back burner, I have a contemporary romance series fizzling around in my brain. The first one is based on one of my favorite historical romance plots – the marriage of convenience. I moved it to the only place I could think of that was a modern equivalent to duke-heavy Victorian London: celebrity-heavy Hollywood, of course. The entire series is Hollywood-based, and on the way home from the workshop, I came up with great blurbs for THREE of the books in it. None of which I’m supposed to be writing right now. And then today, in the shower, a scene with the heroine of book four showed up in my head. I gave in and wrote it down, because I really like her. But after this, I swear, it’s back to the dukes.